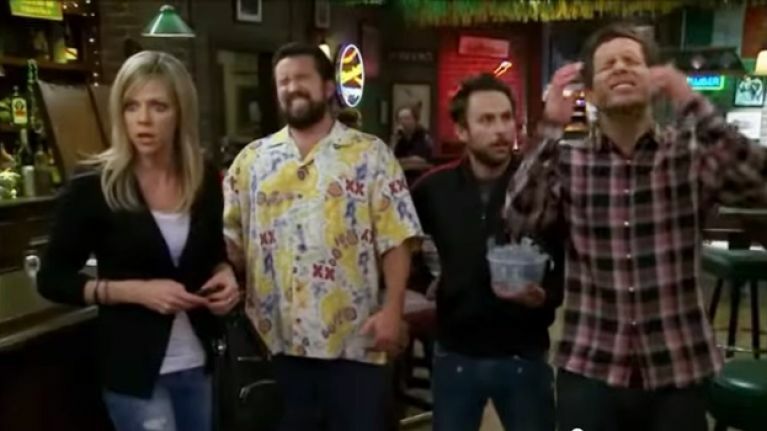 As fans of the show will testify, It's Always Sunny in Philadelphia is one of the best and most underrated comedy offering around these days. *SPOILER ALERT* For the love of god, don't read on if you haven't seen the show. When Dennis and Mac dine at an upmarket restaurant to share some alone time, they are shocked to find that Charlie and Frank are also in attendance. With neither pair willing to make the first move, cue one of the most awkward and amazing staredowns ever. Thunder Gun Express has just been released and the lads will do anything to see it, with Frank's bit of ingenuity the craftiest. Frank shares some very inappropriate anecdotes with his passengers en route in a brilliant moment that looks mostly improvised. During an especially quiet day in Paddy's Pub, the gang decide to reintroduce their favourite - and very unique - board game. The intensity of this "game" is summed up during the compulsory dance-off between each round. The Reynolds siblings are determined to sculpt the ultimate physique, so once their bodies have been perfected the only natural progression is to keep their faces young. Sweet Dee's medical skills are there for all to see when she attempts a spot of botox on her brother. Dennis and Dee's father (or maybe not) Frank has many a bad trait, but one thing he's not is stupid. He fools the gang into thinking he's losing his mind, epitomised in this father-daughter back and forth. The episode's finale makes this all the sweeter for Frank. The gang charmingly compare Dee's features to that of a bird on a regular basis. They also pick up on her rather unique dance moves - moves which can only be compared to this chap. It turns out, the gang know their way around a tune, especially when entering into the Boyz II Men contest. Dennis is quite the perfectionist though, so when Charlie says he reckons they sound 'pretty good', Dennis is not happy. We agree with Charlie, the lads sounds crackin'. She has been around the block, but Charlie still can't win her over. A chance meeting in Jersey Shore changed everything... for one drug-fueled night. It was nice while it lasted though, poor 'aul Charlie. What makes this storyline even better is knowing that the two are married in real life. Charlie Kelly would be oh-so jealous of Charlie Day. There are few words needed here. Playing the 'wildcard' during an oil scheme designed to make quick cash, Charlie takes his new position to the extreme. It's the spontaneity of the moment that makes it so great. Whether it's conducting ocular pat downs, cultivating mass or starring in the gang's production of Lethal Weapon 5 and 6, Mac does nothing by halves. His surprisingly good turn in blackface emphasises the ridiculous nature of the show. Dee purchases some very expensive clobber, which she shockingly cannot pay for at the checkout. What happens next is one of the most amazing failed attempts at a getaway you're ever likely to see. The word has now taken on a whole new meaning to fans of the show. It's the look of terrifying determination on the face of Dennis, combined with Mac's gradual realisation that his friend may actually be a sociopath that makes this moment comedy gold. He would never do anything of course, but there is the implication. When the pressure becomes too much for Charlie in his new job as a mail room sorter, he explodes in what is arguably his finest moment. The scene combines Charlie's manic energy and illiteracy issues in a wonderfully self-destructive mash-up. The fantastic element of this moment is the cocksure confidence that Dennis has in the D.E.N.N.I.S. system. As the scene progresses it becomes obvious to the gang the depths at which Dennis will go to secure a woman's heart. It's all about demonstrating value, y'see. Charlie, Mac and Frank form a band, only for the former to leave over creative differences. When the previously ostracised Dennis meets with the banished Charlie, the pair create a musical classic. The tune became the show's unofficial theme, with the real life actors actually taking the song to the stage, such was its popularity.